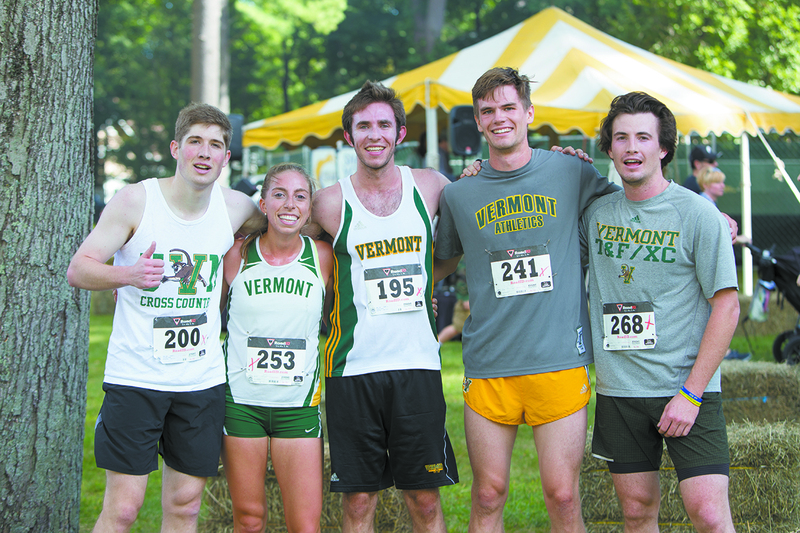 Jamie’s UVM teammates, left to right: Philip Vernimb, Women’s Division winner Sydney Durand, Men’s Division winner Aaron Szotka, Maurie Clark and Tucker Nixon. Armonk was treated to a perfect, warm and sunny day on September 20th. 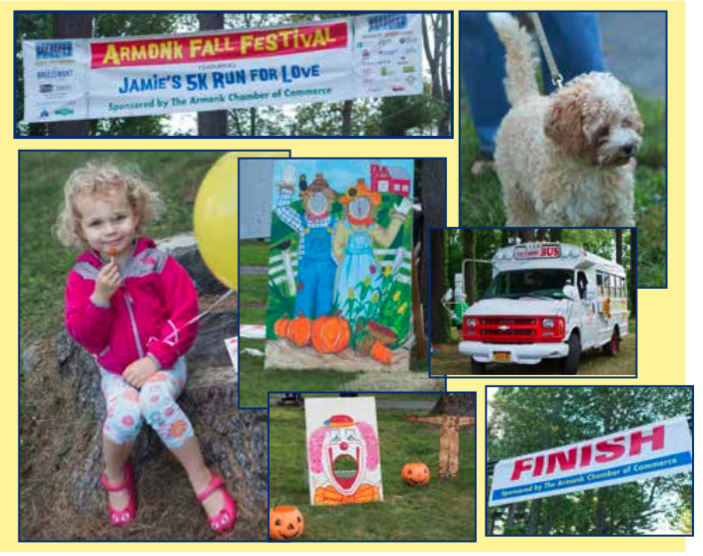 Many residents celebrated the last day of summer at Armonk’s Chamber of Commerce sponsored Fall Festival. The town was bustling, with people laughing at the competitive pie eaters and humming along with the band on the Wampus Park gazebo. Children played on inflatables, competed in bean bag toss games, and ran the 100 Yard Donut Dash and Macintosh Mile. Highlighting the morning’s events was Jamie’s 5K Run for Love, a race in memory of Jamie Love and benefitting the Friends of the North Castle Library. The 5K race began in 2008; Jane Ellen Gertz and Grace Mui of the Byram Hills PTSA made it part of their larger Halloween Fun event, and proceeds benefitted the PTSA. Soon after, the race became part of Armonk’s Cider and Donut Festival. 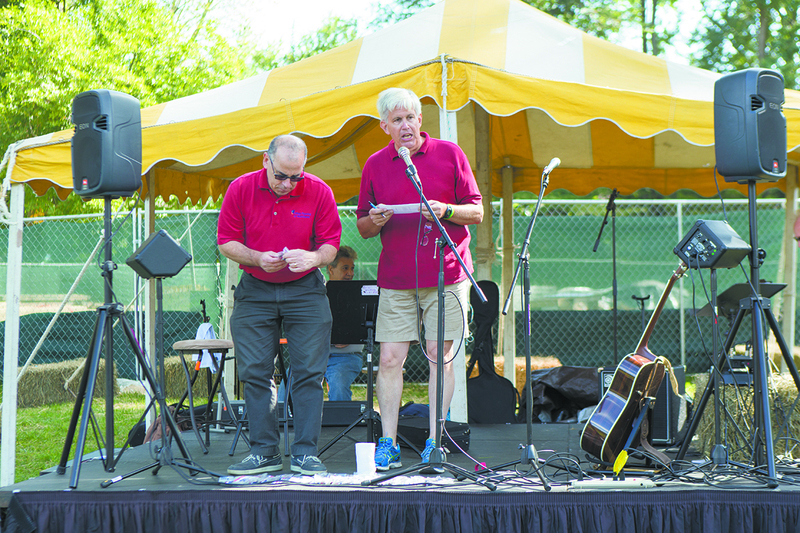 Sean Ryan, then President of the Friends of the North Castle Library, a retired IBMer, and the track and cross country coach at Briarcliff High School, took over coordinating the event with proceeds donated to the Friends of the North Castle Library. Friends of the North Castle Library supports programming at the North Castle Library, including events not supported by tax dollars. Ryan says he became involved to “bring a fun community events to our town where we could focus all residents on the good works we were doing and planned to do at our library.” In 2011, the race was part of the celebration of the 50th anniversary of the Armonk Outdoor Art Show. Then, in 2013 the race was named for Byram Hills High School graduate Jamie Love. Jamie was an Armonk resident, and a University of Vermont student studying mechanical engineering. While growing up in Armonk, he was actively involved in children’s programs at the North Castle Library. He worked at Hickory and Tweed Ski and Bicycle Shop, and he ran for the BHHS cross country team. In 2013, his Junior year, he passed away in his sleep from an undetected heart ailment. 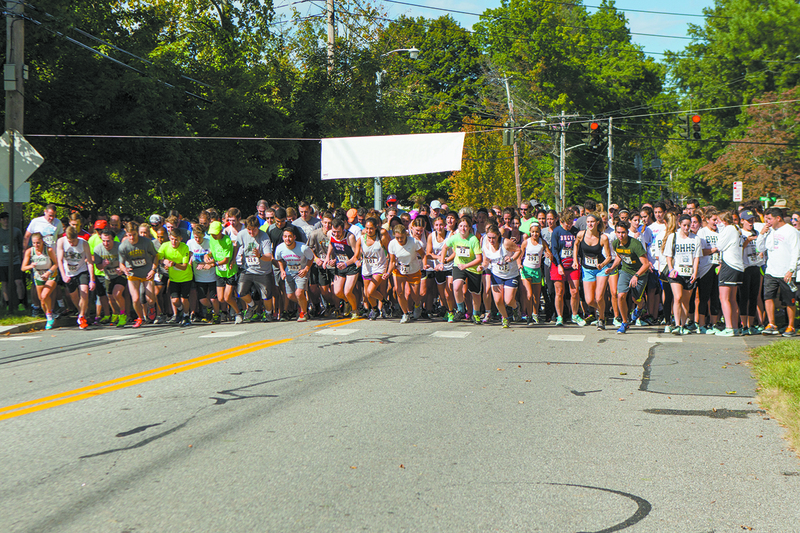 The BHHS cross country team was always a huge part of the annual 5K race, whether it supported the PTSA or Friends of the North Castle Library. Jamie ran in the earliest races before attending UVM; his strong relationship and history with the BHHS team and the race made this a perfect way to memorialize him and honor his memory. Love describes her son as a young man who truly appreciated his friends, his family and his life. For friends who cannot make it to Armonk, her family tries to send out custom tee shirts. “That way, whenever friends and family cannot make it to the race, they can still celebrate Jamie, whether they are running, biking, hiking, eating or simply laughing together. This year, one friend even hosted a pulled pork dinner to honor Jamie,” mentions Love. The image on these shirts, designed by Jamie’s sister and Sean Ryan’s daughter, is a silhouette of Jamie Love and teammates from from BHHS. All of these boys went to State finals for cross country during high school. Re-naming the race in Jamie’s honor sparked an added energy. This year, 286 runners finished Jamie’s Race for Love. Jamie’s UVM teammate, Aaron Szotka, came in first in the Men’s Division at 18:17, and Sydney Durand won the Women’s Division at 20:05. Maurie Clark and Eddie Paniccia came in second and third in the Men’s Division at 18:36 and 19:04 respectively. And Shannon Duffy, with a time of 21:39, and Isabella Vesco, with a time of 22:42, finished second and third in the Women’s Division. The race also united the North Castle community with Jamie’s UVM teammates and friends, many of whom have run the race since Jamie’s death. “Having the race named after Jamie is another chance to celebrate Jamie and what an amazing friend he was. We preserve his memory by wearing JBLOVE rubberized bracelets everyday. I never take the bracelet off,” says Tucker Nixon, Jamie’s good friend and UVM classmate. Armonk resident Charlotte Wittels, a friend of Jamie’s sister Noelle, brought the Byram Hills tennis team with her to run the 5k. “This incident was very close to home, and I’m glad I was able to support Noelle and her family by bringing the tennis team to the event,” states Wittels. And they’re off–close to 300 runners turned out for Jamie’s 5K Run for Love this year. The day was a celebration of all things bright, beautiful and fun–just like Jamie would have wanted and loved! Ultimately, Love feels that friends and family should honor her son by “laughing and living their lives to the fullest.” Jamie’s UVM friends fondly recall that Jamie always had a smile on his face. On a beautiful day like September 20th, with people enjoying the beautiful weather, listening to music, visiting with friends and community members, running races and shopping local, Jamie most definitely would have been smiling. Deborah Raider Notis is a writer and co-owner of gamechanger, LLC, a free referral service connecting Westchester families to highly qualified, competitively priced instructors. She lives in Pleasantville with her husband, four boys and their dog Oscar.